Yes, and I stopped watering it for about 8-10 weeks. Then, when I gave it a little water, it started blooming. I thought you would remember us discussing this. It has even more little buds on it ready to bloom and I would love it if they all bloomed at the same time. What do you mean those little buds don’t come too much? You mean they only come once a year (Christmas, if you do it right)? That’s a very pretty cactus, PJ. We’ve had one with red flowere for quite a few years now and it generally blooms just before Christmas. It has lots of flowers now and looks amazing. I imagine yours will last a long time, too. Thank you Millie. I did not know what I needed to do to get my cactus to bloom. About 2-3 weeks prior to Christmas and it wasn’t even looking like it might bloom, I looked it up on the internet. So I immediately put it in my bedroom where there is semi-light and just stopped watering. All together it took about 12 weeks to bloom. If you have had yours for years then it must be huge! I have a large pot to put it in and as soon as I buy potting soil I will transplant it. 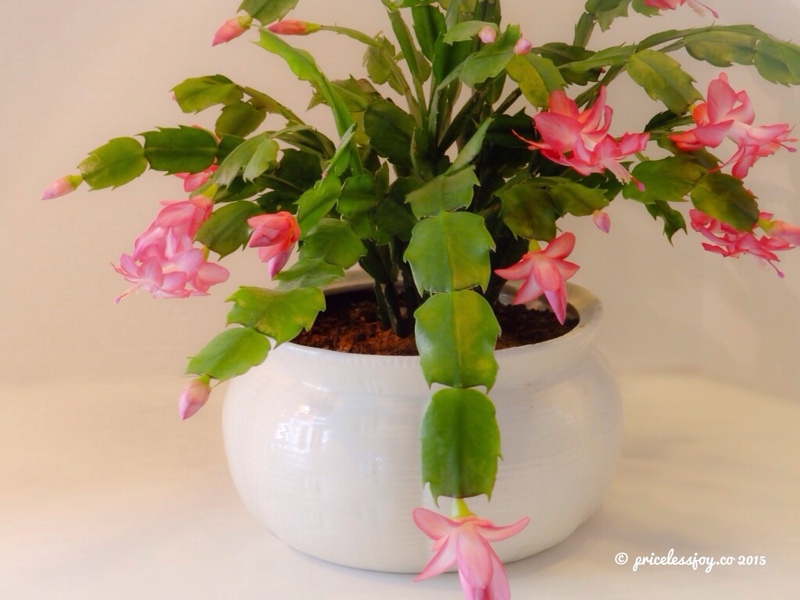 That is one reason I have loved Christmas cactus’ because they bloom in the winter when flowers are much needed! 🙂 I hope mine will continue doing well. Thank you for asking your husband for me. Thank you! Took long enough to get it to bloom! When talking about plants, I could be called a serial killer. I have few very old plants (over 20 years) that got used to me and survived my constant neglect. As for the new ones, I give in and buy a new plant once in a while, just to watch it die a slow and painful death. This is one beautiful cactus and I hope it brings you many more years of joy. Thank you so much. I have enjoyed this cactus especially since it started blooming – and to think it took absolute neglect to get it to bloom. It has grown about 4X from what it was when I got it a year and 2 months ago. I have a large pot that I am going to plant it in and see how much larger it will get. It’s called a Christmas Cactus. Yes, I had to put it in a semi-dark room with no water for about 8-10 weeks. Then I gave it a little bit of water and it started budding. I then placed it where there is a “little” more sun and the buds started blooming. I didn’t either until it was too late to have blooms for Christmas. It’s beautiful, PJ 🙂 And the picture is, too. I may try one of these. Stick it away for a few months and then such beauty? I must try this! I had no idea I had to anything special to make this little cactus bloom. When it came close to Christmas and it wasn’t even showing signs of blooming, I looked it up on the internet. I did what it said and 8-9 weeks later it started budding and about 12 weeks to the day it bloomed! I was so happy. Beautiful Christmas cactus, even if it did bloom in February! It is a beautiful cactus!! I didn’t know that you had to do all that either. I had to look up Christmas Cactus on Google to find out what I needed to do to make it bloom. I had no idea.